Opposition politicians have attacked the UK's Serious Fraud Office's (SFO) decision to drop a corruption probe into a defence deal with Saudi Arabia. Prime Minister Tony Blair said national security had dictated the SFO's decision but the Liberal Democrats said cash had been put before principle. The SFO had been studying a 1980s deal between BAE Systems and Saudi Arabia. Reports said the Saudis had threatened to pull out of a new £6bn deal with BAE unless the probe was brought to an end. Lib Dem MP Norman Lamb has called the SFO's decision "outrageous and disgraceful". The SFO had been studying BAE System's Al Yamamah arms deal with Saudi Arabia, which dates back to the 1980s. BAE was accused of setting up a slush fund to sweeten the deal, something the firm had strongly denied. But on Thursday the Attorney General, Lord Goldsmith, announced the SFO was dropping the probe, and said he thought that a prosecution "could not be brought". He added that the decision had been made in the wider public interest, which had to be balanced against the rule of law. Lord Goldsmith also insisted that no weight has been given to commercial interests or to the UK's national economic interest. The SFO's decision to end the investigation comes after repeated suggestions that the Saudis were angered by the probe, and were threatening to pull out of current plans to buy 72 Eurofighter planes from BAE for £6bn. Liberal Democrat peer Lord Goodhart told the BBC's Today programme that he thought the government had given in to blackmail. "I think what has happened here is that we have been bounced into this decision by what is effectively blackmail by the Saudi Arabian government," he said. "I think that the decision of the SFO was forced, it wasn't a decision, it was forced on the director of the SFO." Mr Lamb added that he thought the decision to end the investigation "completely undermines the UK's reputation on good governance". "How on earth can we lecture the developing world on good governance," he said, "when we interfere with and block a criminal investigation in this way?" Conservative MP Bernard Jenkin said it had been a "sorry episode". "The SFO should not be tempted to go on these fishing expeditions unless prosecutions are likely and these prosecutions are in the national interest," he said. Former Conservative minister Jonathan Aitken had responsibility for overseas defence sales, including deals with Saudi Arabia, during his time as a Conservative defence minister in the 1980s. He said that even if the allegations against BAE were true, it was the correct decision to end the investigation in order to maintain good relations with Saudi Arabia. Shares in BAE Systems were up 6% in early Friday trading. If prosecutions are unlikely what is the point of putting a multi-billion pound contract under pressure? While the Lib Dems and Conservatives MPs have criticised the SFO's decision, it was welcomed by Labour MP Lyndsay Hoyle, whose Lancashire constituency is home to BAE's main Eurofighter facility. He said many of his constituents were celebrating "an early Christmas present". 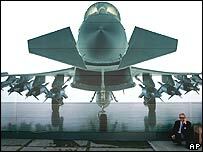 BAE directly employs 5,000 people on the Eurofighter project.